CSS is a simple, declarative language for creating style sheets that specify the rendering of HTML and other structured documents. 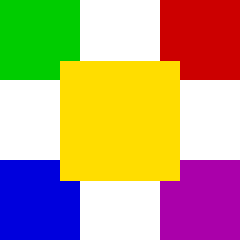 This specification is part of level 3 of CSS (“CSS3”) and contains features to describe layouts at a high level, meant for tasks such as the positioning and alignment of “widgets” in a graphical user interface or the layout grid for a page or a window, in particular when the desired visual order is different from the order of the elements in the source document. Other CSS3 modules contain properties to specify fonts, colors, text alignment, list numbering, tables, etc. The features in this module are described together for easier reading, but are usually not implemented as a group. CSS3 modules often depend on other modules or contain features for several media types. Implementers should look at the various “profiles” of CSS, which list consistent sets of features for each type of media. This module was originally called “CSS Advanced Layout.” Other changes since the 2007 draft include: The section on tabbed display (stack of cards) has been dropped, because it doesn't have the same priority. Two additional kinds of intrinsic widths (‘min-content’ and ‘fit-content’) and a way to set a minimum and maximum width for a column were added. The size calculations for slots are more precise and a note mentions the possible addition of a flexibility parameter to tweak the algorithm. CSS background and borders [CSS3BG] – property background. An element with this ‘display’ is similar to a table element, in that its content is laid out in rows and columns. The two main differences are that the number of rows and columns doesn't depend on the content, but is fixed by the value of the property; and that the order of the descendants in the source document may be different from the order in which they appear in the rendered template. If the keyword ‘inline’ is present, the element is an inline-level element, otherwise it is a block-level element [CSS3BOX]. Each string consist of one or more letters (see <letter> below), at signs (“@”), periods (“.”) and spaces. Each string represents one row in the template, each character other than a space represents one column in that row. Spaces have no meaning. They may be added for readability. An explicit height for that row. Negative values make the template illegal. The orientation of the template is independent of the writing mode (‘direction’ and ‘writing-mode’ properties): the first string is the topmost row and the first symbol in each string is the leftmost column. The intrinsic minimum width of a letter or “@” is 0 if that slot spans two or more columns; otherwise, it is the intrinsic minimum width as defined by [CSS3BOX]. For the purpose of that definition, the slot is considered as a block with a ‘block-progression-direction’ of ‘tb’ with its contents as its children. The intrinsic preferred width of a letter or “@” is the intrinsic preferred width as defined by [CSS3BOX]. For the purpose of that definition, the slot (which may span several columns) is considered as a block with a ‘block-progression-direction’ of ‘tb’ with its contents as its children. Note: In a future update of CSS, columns might get a property to allow them some flexibility to become wider than their intrinsic preferred width under certain conditions or by a certain amount. The height of a slot is measured as if the slot had one anonymous block as a child that contains all the slot's contents, and both the slot and the anonymous block have a ‘block-progression-direction’ of ‘tb’ and the anonymous block's height is computed as a flow root (see “Auto heights for flow roots” in [CSS3BOX]). Roughly, this means the height is from the top margin edge of the topmost element to the bottom margin edge of the bottommost element or of the bottommost float. This value of the ‘position’ property specifies into which row and column of a template the element is placed. The <letter> must be a single letter, with category Lu, Ll or Lt in Unicode [UNICODE]), or a “@” symbol. The element is taken out of the flow of its parent and put into the specified slot in its template ancestor. If there is no slot of that name, the computed value is ‘static’. A value of ‘same’ instead of a letter computes to the same letter as the most recent element with a letter as position that has the same template ancestor. If there is no such element, the value computes to ‘static’. Multiple elements may be put into the same slot. They will be layed-out according to their ‘display’ property in the order they occur in the source document. The content of a template element is put in the slot marked with “@”s. If there is no such slot, the content is put in the first (leftmost) slot on the first row that doesn't consist of only “.”. All background-* properties (including the ‘background’ shorthand). The background of a slot is drawn immediately on top of the background of the template element itself. 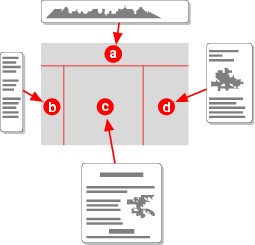 A template can also be attached to a page, rather than an element. Such a template is called a page-based template. The Grid Positioning Module [CSS3GRID] defines a ‘gr’ unit that is usable with certain properties that position or size boxes. A template element defines an implicit grid (in the terminology of that module) for use with the ‘gr’ unit. 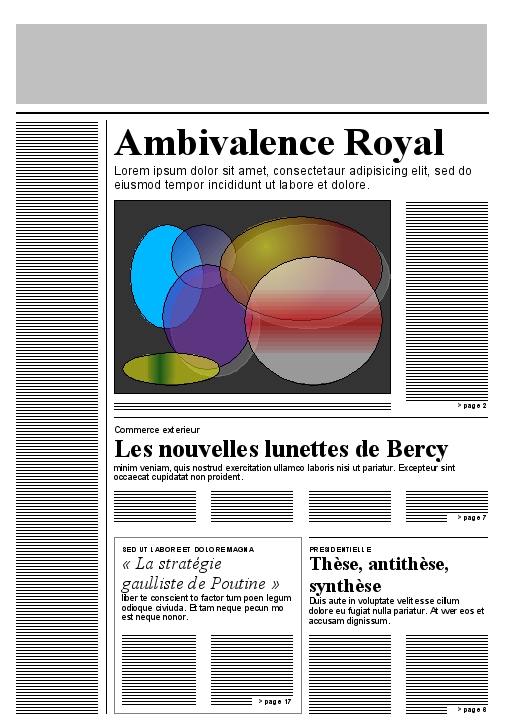 The vertical grid lines are formed by the left and right content edges of the template element and by the edges between the columns of the template. The horizontal grid lines are formed by the top and bottom content edges of the template element and by the edges between the rows of the template. The top content edge and the left content edge have the number 0. The shape, size and flexibility of the layout are specified with the character martrix. Some properties (background, border and vertical alignment) are attached to individual slots. César Acebal built the first prototype. Andrew Fedoniouk built the second.